The following text is based on a talk by Makiko Hara given during the Fillip guest lecture series on 26 April 2007 at the Emily Carr Institute (now Emily Carr University) in Vancouver, British Columbia, as part of our Institutions by Artists series. 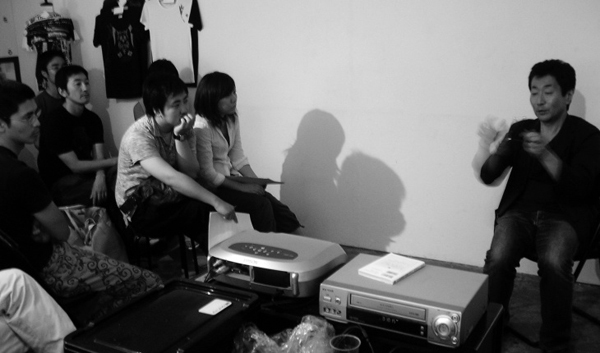 The talk was produced in cooperation with ArcPost, a project of the Pacific Association of Artist Run Centres. I recently called the artist On Kawara at his home in New York to discuss the inclusion of his work I am Still Alive—an early telegram series that the artist produced in 1970s—in an exhibition I am planning. In a positive sense, our conversation confused me, making me think about art and its paradoxical relationship to language. He pointed out that our thoughts and consciousness are constructed by language, but that we have to be aware of the limits of language. He told me that throughout Japan’s history, “essentially ‘art’ has not existed.” Everything could be categorized as either decoration or design, meaning that “art” has always had some purpose or practical function. He thus argued that within this context, there is nothing that can be defined purely as “art.” To this I asked, “what is art”? He replied that this question is important, but that the word “art” itself essentially contains this question. That is to say, if something is automatically or conventionally defined as “art” without struggling, he would refuse to call that thing “art.” It was like a Zen question and answer. Put more logically, On Kawara seems to define “art” not as a representation of a statement or idea, but as the idea or thought that communicates directly without language. What is Tokyo Art Speak? Tokyo Art Speak was an autonomous movement formed by a group of people in Tokyo between 1993 and 1997 and then again between 2004 and 2006. Its mandate was to change the present situation of art and its institutions through critical thinking and by questioning authority. I co-founded the group along with my partner art critic Masashi Ogura. We started the project with some friends who shared a similar concern over the lack of critical discourse in the Japanese art scene at the time. We began organizing monthly informal, bilingual, roundtable discussions in small groups of ten to twenty people. These groups discussed various issues related to art and institutions, and organized art events, public forums, video screenings, live performances, and exhibitions. We called the project TAS for short in reference to the SI (the Situationist International of the 1960s) and the AS (the Art Sociologique, a post-Situationist movement that took place in Switzerland and France in the 1970s). When we started TAS, I was twenty-four years old, still young, and with a passion for the organization that sometimes got carried away. In retrospect, the Japanese art scene in the early 1990s was similar to that of present-day China. It was at the beginning of its boom within the international art market. There were many exhibitions featuring Japanese contemporary art organized in the United States and Europe, and many curators and art dealers were visiting Japan searching for young art stars. There was a very optimistic atmosphere with high expectations as Japanese artists became involved with the “international art scene.” In this context, inserting a critical discourse seemed crucial and urgently necessary. We started TAS just after I came back from Canada where I attended a one-month summer arts administration residency program at the Banff Centre. While I was there I was struck by the many intense and inspiring discussions around issues of identity, postcolonialism, gender, the body, and politics. As a young Japanese curator who wasn’t used to this type of discussion, I experienced a big culture shock. Soon after I came back to Tokyo, I was frustrated with the lack of critical discourse within the national art scene. In an effort to address this lack, Masashi Ogura and I called together friends from different fields: Toshimaru Ogura, professor of sociology at Toyama University; Sohei Imamura, an architect who studied at AA School in London and had just recently returned to Tokyo; Timothy Blum, an art dealer and current co-director of Blum and Poe gallery in Santa Monica; and Peter Bellers, a foreign newspaper journalist and artist from England. The main purpose of TAS was to extend critical thinking and to question the institutional structures in art and their authority. We also examined alternative art practices that referenced the constraints of an institutional framework. In order to address these models, we decided against having a permanent space, instead organizing the meetings at community spaces that rented by the hour or utilizing existing galleries. It was a parasitical strategy that reflected our skepticism towards convention within the art system. The topics we discussed were wide-ranging, but mainly examined the existing institutional structure of art in Japan and how it related to the global phenomenon of the international art world. In many ways, writing a history of Tokyo Art Speak is like composing my autobiography. During a fifteen year period, we took many breaks, restarting according to the situation that had developed in the interim. The project thus doesn’t have a continuous history, instead often forming in direct response to specific events in the Tokyo art scene. Between 1993 and 1996 heated discussions emerged around the following questions: Who has authority in the art world? How is this power constructed? How does the art institution make star artists? Who determines the value of art? How can art change social situations? How can we re-appropriate existing art institutions? How are Japanese art standards constructed? How do these standards differ from those in the West? Are rental galleries still needed? Are there other alternatives? Why are there no public funds for individual artists and curators in Japan as there are in other countries? When addressing these questions, our discussions sometimes became intense with emotion. For example, some participating artists questioned, in a fury, what is wrong with being an art star? Why should we be so critical about the art star in the present institutional art system? With TAS, what we aimed for was not a conclusion as to who was right or wrong, but rather to encourage a critical examination and debate. In an attempt to address global issues, we regularly invited guest speakers from different countries. To mark the occasion of the exhibition Displacement that Masashi Ogura curated in 1996 at Yokohama Citizen’s Gallery, we invited Lani Maestro, an artist born in the Philippines who had immigrated to Canada in the 1980s. Vancouver artist and curator Hank Bull was also among our international guest speakers. These lectures often focused on the relationship between art practices and issues of displacement and migration in globalization eras. In 1996 we held a large panel discussion on the new wave of Asian contemporary art and its interactions with the international art market. The panel featured both international and Japanese speakers, including Fei Dawei, an art critic and an independent curator based in Paris, Tatsuo Miyajima, an artist who had participated in many international exhibitions in Europe, North America, and Asia, and Raiji Kuroda, a curator at Fukuoka Asian Contemporary Museum. By 1996 TAS was firmly established within the Tokyo art scene. We were often invited to organize larger events. As the group gained popularity, event attendance rapidly increased. Looking back, this increased popularity signalled both the project’s success and the beginning of the decline for its potential. Once attendance exceeded one hundred people per event, it was very hard to control the level and quality of the discussion and it also created a hierarchy between speaker and audience. We were opposed to this hierarchy, instead encouraging all attendants to participate in debates. Many new participants, however, misunderstood the purpose of the project. Thinking that TAS focussed on public lecture events, they expected to learn information by attending a “lecture.” It was hard to create a balance in terms of public access because we didn’t want to be exclusive. And yet our new popularity suddenly pushed loose the potential for criticality established within the early, smaller groups. We began to question how, if at all, we should restructure the organization. In gaining a voice, our position in the Tokyo art scene became ambiguous. We were aware that TAS was being institutionalized and absorbed into the art system, but we weren’t sure how to forge our position within that system. So we decided to take a break, and I left Japan to study in Montreal. Between 1997 and 2002, there was a dormant period, which allowed us to think about how TAS had impacted the Japanese art scene. By 1997 the Japanese art world had become ever increasingly commercialized and institutionalized. Several years ago, however, I met with a young artist unit called Kosuge 1-16 founded in 2001 by Chishino Kurumada and Takashi Tsuchiya. They told me that they were very much influenced by TAS—that as young art school students, the project encouraged them to proceed with their alternative art practices. Since forming, they have organized many workshops and art projects within their community. Their aim is to draw attention to adventure and discovery in daily life through art and humour. They believe that art is just an everyday occurrence. Though I didn’t know they had attended Tokyo Art Speak, they said that without meeting with the group, they might not have continued to pursue art given the despair they felt toward the Tokyo art scene at the time. It was a great compliment and I was very happy to learn about what they were doing. They have produced many alternative art projects including one of my favourite works Barrier Free Bypass for Bicycle (2002). They made a barrier-free environment inside a small house in their neighbourhood. Through the main entrance and the back-side of the house, they created a short-cut path for local pedestrians. Used for dog walks, food delivery, and other purposes, the path established a new mode of communication within the neighbourhood—a model which perhaps echoes the initial spirit from which TAS was established. When I returned to Japan in 2002, many of the original members of TAS suggested that we start the project again. Along with a few new members, we eventually restarted the TAS in 2004. In order to keep our autonomy and avoid the problems that had occurred in the past, we decided to remain small, exclusive, and informal. The new core members consisted of artists, art critics, architects, and sociologists. This time we focussed on examining urban issues related to art and architecture. We organized study groups and discussed the following questions: What is the social responsibilities and functions of artists and architects? How can we actively shape own lives in relation to urban space? During this period, I also organized several art projects under the name of Tokyo Art Speak. One of the most successful projects was A Sultry World, a live installation by Noriko Sunayama held at the entrance hall of Yokohama Museum in June 2006 and organized in collaboration with Yokohama Museum, Art Lab Ova, and Yokohama French Institute. A Sultry World consisted of a 10 × 20 meter long velvet dress in which a performer (the artist or a volunteer) sat at the centre and invited people to tumble through the ruby coloured folds into the illuminated space under the skirt. When visitors entered the skirt, they could see the lower body of the performer. But the visitor under the skirt was also visible to those standing outside the dress. The structure of the gaze was thus unexpectedly twisted, allowing viewers to critically engage in issues of gender within an intimate (yet resolutely public) space. In establishing a space of wonderment, the work challenged our conventional behaviour in an institutionalized space. Welcome to “A sultry world.” Because women lack physical strength, we dream of being skunks, in an elevator, a lonely alley, walking alone at night. Be a skunk for any situation. For strength: poison. For love: the scent of blue lavender. I don’t want to get dirty, so please don’t walk on my skirt. Cover the skirt completely, crawling, and come to me. Sunayama first showed A Sultry World in 1995 at Mito Art Centre on the occasion of a John Cage exhibition. The work then travelled to France and Spain, finally returning to Japan to be presented at Hiroshima Contemporary Art Museum in 1996. Since then, the work had stayed in Hiroshima in a museum storage facility. When the curator retired, Sunayama had to deal with the problem (and expense) of storing the large piece. When we first spoke in early 2006, she was thinking about discarding the work. We decided to show the piece again, to find a way to rescue the work, and to give it another life. It was an urgent issue, and the process of finding an exhibition space and raising funds had to be done in just two months. Although it was arranged very quickly with the curators of Yokohama Museum, in a way, we used a strategy of public intervention to situate the piece within the museum. The curator of the museum wanted to push the limits of how “public space” is used and we needed a space to present the work. While we were in co-partnership with the museum, we never gave up our autonomy. Rather than relying on the hosting institution, we set up a foundation to organize the event and raise the needed funds. It was with an interest in this type of alternative, critical relationship to public art institutions that the Tokyo Art Speak project was founded. Noriko Sunayama’s work—and the way in which it came together at the Yokohama Museum—pointed to a valuable lesson of the TAS project. On the one hand, we have to be aware that we are always part of institutions. At the same time, we have to criticize and provoke change within this system. In many ways, both TAS and A Sultry World prompted me to address the ways in which we always need to question our own ways of thinking, acting, viewing, and enacting projects. Born in Tokyo and immigrated to Canada in 2007, Makiko Hara is Curator and Associate Director at Centre A, the Vancouver International Centre for Contemporary Asian Art. Since the early 1990’s she has curated numerous international exchange exhibitions between Japan, Canada, and France, and served as project coordinator for several international exhibitions, including the International Triennale of Contemporary Art in Yokohama, 2001/2005; and The Echigo Tsumari Art Triennale, 2003. Hara was one of the three guest curators for the Scotiabank Nuit Blanche in Toronto in 2009.